Today has been incredibly emotional and full of tears for me. I’ve had tears from pride all the way to tears from my heart breaking, and I’m closing out this day feeling emotionally drained to say the least. Let me preface by saying the fact that I was nominated for the LifeChanger of the Year award is enough to make my lifetime. It feels great to be appreciated, and even better to be appreciated by someone who has actually sat in my classroom as a student, and yes I would absolutely love to be the winner of this award, but today I realized something important. Do you see that picture above? I received that card this morning before one of my very special students was going to walk the hall in her cap and gown because she completed her final course and is our campus’ newest graduate. Yes, we still have a graduation ceremony at the end of the year like everyone else, but a bonus of being on a small campus is that we can do things other schools can’t. The students and staff on our campus become somewhat of a second family, and this tradition is just something sentimental we do to acknowledge the hard work our students have done and to share in celebrating with them. We all stand in the hallway and cheer them on as they walk down to a song they’ve chosen to play, and our principal says a few words about them at the end. It’s such a meaningful thing for all of us. Before our newest graduate walked down the hall, I noticed this card placed on my desk, and I read it. What I realized at that moment was that THIS . . . this right here is my award. Whether I am recognized by the National Life Group as this year’s LifeChanger of the Year or not, I have been given this award by many students over the years, and this picture is a picture of one of my trophies. I read it, and I cried. I walked next door to where this student was preparing to walk. I hugged her, and I cried. There are no words to express the pride I felt for this young lady who has been through so much, a young lady who even a year ago struggled to imagine herself actually graduating, a young lady who has grown so greatly over the past year and who I was blessed to see the transformation she went through, and a young lady who has touched my heart and probably doesn’t even realize she’s had just as great of an impact on me as I have her. After she walked and students went back to their classrooms, I watched as her friends and family gathered around her to take pictures. I watched how happy she was, and I watched the plethora of teachers (even teachers from a campus across the street) come by just to see her special moment. This girl doesn’t realize how amazing she really is and how everyone she comes in contact with is impacted by her. This time they were bittersweet tears because I’m so incredibly proud of her, but the realization hit that her sweet presence will no longer be in my classroom as my student. She is moving on to far better things, and she is going to change lives . . . but I’m sure going to miss her. So, today I was awarded with the most recent award for being a Life Changer, and I’m completely humbled. But that wasn’t the end of my tears. We were still only in the first few hours of the school day. I have another student. I won’t lie. I was nervous to have this student in my class because I didn’t know if I could be the teacher he needs. I still don’t know if I can be, but I’ve become thankful he was placed with me. This student has Tourette’s, and for those of you who think you know what that means because you’ve watched a movie where it is presented almost as a joke, then you have no idea what it is. I didn’t completely know, but I’m learning. He is teaching me. This boy has one of the sweetest hearts I’ve seen, and he wants so badly to reach out to people and help them in whatever way he can. But often he gets frustrated at the things he can’t control within himself. This afternoon I heard something from where he was working, and it wasn’t a sound I typically hear from him, so I looked over and noticed tears falling down his cheek. I went over to check on him, and we ended up moving to the hallway so he could talk. He talked, and he cried. I still didn’t know what was going on, but these weren’t small tears, so I knew it was something real. As I listened to the boy’s words as he said he watches the other students and sees how they can sit still in a chair and how they can focus on their work, and it’s not fair that he can’t, and he just doesn’t understand why he’s like this . . . Do you understand how difficult it was for me to keep my composure while my heart was breaking to pieces for this kid all while knowing there’s nothing I can do to help him, and there’s no way I can ever find the right words to say to him? I couldn’t keep them in for much longer. I listened, and I cried. Fortunately, another teacher came by right as the tears made their way to the surface, and I was able to push them back in. Almost daily I encounter people who remind me to never take things for granted. To the teacher who is exhausted and looking forward to the next holiday – only to find out the holiday belongs to the students while you have a professional development day – I say to you, “Do not take the time in your classroom for granted.” Your students need you. To anybody reading, I say, “Do not take any part of your life for granted.” You have no idea who needs you. I know this post is long, and I know it kind of went from one topic to something completely different, but this was my day. This is what it’s like most of my days. 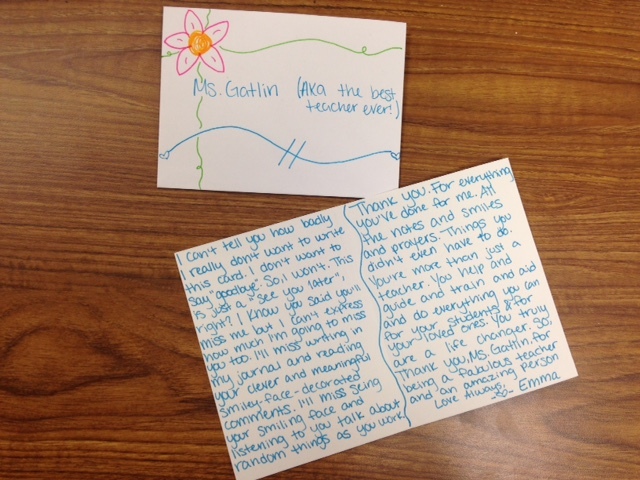 This is why I teach. From Feb 6, 2015 Why Do I Teach? I nominated my favorite teacher from high school for the award after reading about it on your blog. You are very inspirational, and I really enjoy your blog. Thank you for everything you do for your students! Oh I bet it made that teacher’s day, too! Thank you for your encouraging words.